For the dough, crumble the yeast into the milk and stir to dissolve, then add the beaten egg. Now, in a separate bowl, mix the flour, sugar, cardamom and salt. Rub the butter into the flour mixture with your hands, then mix in the milk mixture. Knead well on a floured surface. Put the dough into a bowl, cover with a tea towel and let it rise for 1–2 hours, or until doubled in size. For the filling, mix together the butter, brown sugar and cinnamon. Divide the dough in half and roll each piece out on a floured surface to make a rectangle measuring about 45 x 30cm. Spread the cinnamon filling in the middle of each piece, leaving 2cm clear along the short sides and 5cm clear along the long sides. Fold the 2cm ends in over the filling at the ends. Fold one long side over towards the middle, then fold the other long side over, too, so that there is a slight overlap and the filling is completely encased. Line 2 baking sheets with baking parchment and place a pastry piece on each. Cover with a tea towel and leave to rise for 30 minutes. Preheat the oven to 180°C. Lightly beat the remaining egg and use it to brush the pastries. Sprinkle the chopped almonds on top. Bake for 18–20 minutes. Leave to cool on a wire rack for 10 minutes, then cut into slices and dust with icing sugar to serve. 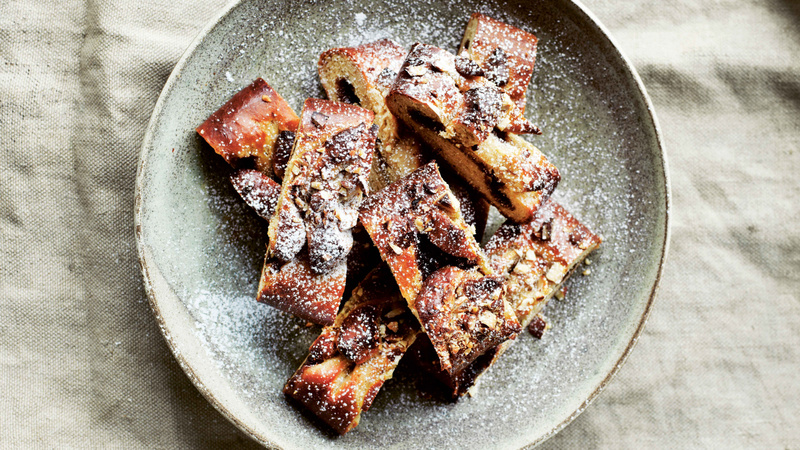 From Copenhagen Food by Trine Hahnemann; photography by Columbus Leth. Published by Quadrille.